Personally I think they’re both just being Dicks. Ahh. Mo scores a point against the barmaid. Cynically manipulating semantics perhaps, but he is right. Many an apologist has expected to put an end to discussion in just that way. You’ve torn off another great strip, author. I’ve been wondering when/if they would ever get the last word. If you can call it that… This strip is way too much like real-life conversations I’ve had. Mo hasn’t scored a point against the barmaid; he’s shown what a peterhead he is. Which is the point of the cartoon. Unfortunately, Mo is quite correct. Yep, you can! That’s about it right there. J&M look too pissed to worry about who’s right or wrong. (And not pissed in the American sense, transatlantic readers: that would just be true to form). 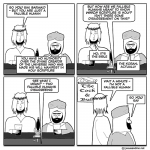 Maybe an answer to religious conflict: get everyone pissed? By jove, I think I’ve solved the problem. 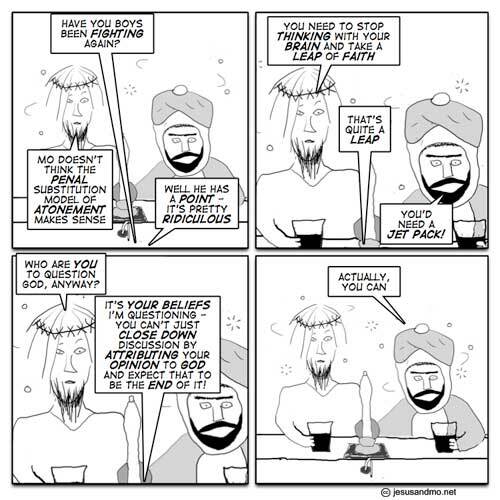 If Mo had said “ACTUALLY HE CAN, ” then the barmaid’s comment would be clearly wrong, since Jesus’s statements are not an attribution to god, but are directly from god. how does one go about thinking without his brain? The barmaid still has the upper hand. Mo can expect that to be the end of it all he likes, but of course it won’t be. Go barmaid! Religion might be more appealing if they did hand out “Jet Packs of Faith.” You know…if they actually worked. I’m falling and my jetpack isn’t working!! The penal substitution model may be a leap of faith for those who feel no shame. Of course, this personalistic aspect isn’t discussed. Barmaid dismisses the whole issue because her opinion that God doesn’t exist is indisputably correct. Very reasonable – no hypocrisy there whatsoever. “The penal substitution model may be a leap of faith for those who feel no shame”? That makes no sense. If you feel no shame, then you don’t believe there’s anything to punish, regardless of who gets the punishment. If you do feel shame, then the proper response is to expect punishment YOURSELF. If I do something wrong, I wouldn’t expect someone else to pay the price, and I’d feel even more ashamed if an innocent party suffered from my crime. If I do something wrong, *I* am the person who should be punished. Jesus’ punishment only makes sense if it was atonement for his (God’s) own sins. Like, say, the whole expelling-from-Eden incident, or the Flood, or torturing innocent Egyptians for their unelected pharoah’s crimes, etc. etc. etc.